This sampler has a special story. I designed the Angel while I was with my mom on her last morning, to keep something to remember that day when she wouldn’t be with us anymore. In the meantime my dearest friend, Judy Odell, in California wrote a wonderful poem dedicated to my mother and sent it to me with an email message. On December 3rd, when I went home, I saw her email and…. my angel was inside Judy’s poem! 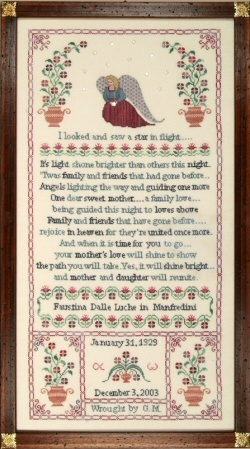 This sampler is not solely dedicated to my mother Faustina, even though it has been designed and stitched with the remembrance of that special night. It is a mourning tribute to a gifted life with the hope of being together again one day. Might the stars in the sky be our blessed loved ones and our special guiding light not only in life. A special donation to the American Cancer Society will be given out of the sales of this design, in memory of my mother Faustina.